Wind-Up LED flashlight with cell phone charger, siren alarm and radio. You will never have to worry about batteries anymore because this great new high-tech torch light has a built-in battery and rotary charging for powering its rich selection of useful features. So what can you do with this baby? (1) Charge your mobile phone with a few simple wind-ups to give it a power boost. (2) Scan and listen to your favorite FM radio channel through its on-board speaker or headset jack. (3) Use the loud siren alarm feature if you are lost or need help. 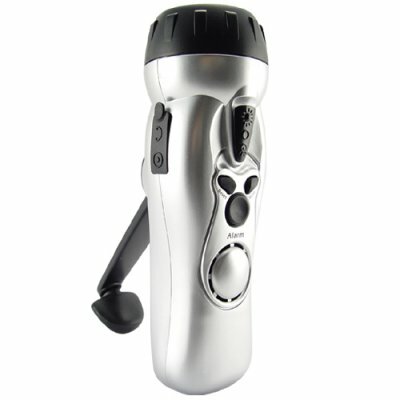 (4) Give yourself some work light at night with its cool white colored LED flashlight. This model is a must have item for every member of the family as well as a great tool for your own home and car. The 4 in 1 Wind-Up flash light makes a great gift for yourself and the ones you love.